Back cover blurb: From the bestselling author of THE WEIRD SISTERS comes an enchanting tale of self-discovery that will strike a chord with anyone who has ever felt they’ve lost their way. Chicago, 1999. Madeleine is trapped – by her family’s expectations, by her controlling husband – in an unhappy marriage and a life she never wanted. But when she finds a diary detailing her grandmother Margie’s trip to Jazz Age Paris, she meets a woman she never knew: a dreamer who defied her strict family and spent a summer living on her own, and falling for a charismatic artist. When Madeleine’s marriage is threatened, she escapes to her hometown to stay with her disapproving mother. Shaken by the revelation of a family secret and inspired by her grandmother’s bravery, Madeleine creates her own summer of joy. In reconnecting with her love of painting and cultivating a new circle of friends, the chance of a new life emerges – but will she be bold enough take it? The Light of Paris is the first Eleanor Brown novel that I've had the pleasure of reading, and it certainly won't be my last. The Light of Paris is a tale of two women from the same family, who although born decades apart face the same struggles in life. Madeline is married to Phillip, a wealthy and successful man, she volunteers at the local art gallery as he doesn't want her to work, but she would much rather be an artist. When Madeline returns home to her Mother's house after a spectacular row with Phillip, she discovers her Grandmother Margie's diaries whilst rummaging through the loft. She is shocked to discover that she is more like her Grandmother than she ever could have imagined. But it makes her determined to finally pluck up the courage to put her foot down and get more of what she wants from life, rather than what other people want her to be/have. The Light of Paris is the ultimate self discovery novel, and I think we all have a little of Margie and Madeline in us. 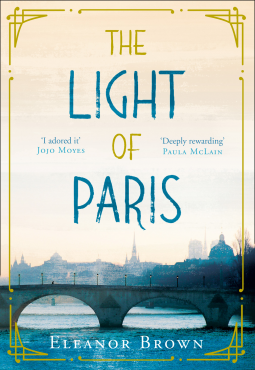 The Light of Paris is available from 14 July 2016.